Research firms App Annie and the International Data Corporation (IDC) have co-published a new report for E3 today looking at the growing popularity and consumer spend for video games available on smartphones and tablets. Not surprisingly, the duo is predicting that Android and iOS will extend their lead as the prominent platforms in the mobile and portable gaming space. This should be expected given that dedicated devices such as the Nintendo 3DS and PlayStation Vita are bought almost solely for playing games. Smartphones and tablets, meanwhile, have multiple uses which extend beyond video games, making them a popular choice with a much broader range of consumers. Nevertheless, IDC and App Annie suggest that Android will gain an extra 10 percent market share by 2014, residing just below the 60 percent mark for the total install base. Apple’s iOS platform will take a smaller 2 percent rise, while other mobile operating systems will drop a single and solitary percentage point. 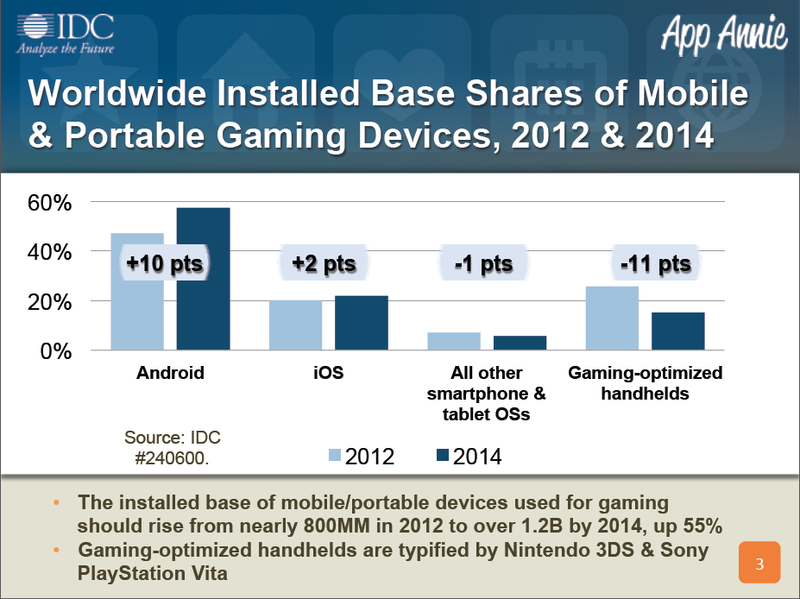 Handheld consoles, for comparison, will drop 11 percentage points and fall behind iOS for the first time. The growth in mobile gaming has also overthrown the traditional model for selling content to players. The $60 boxed product still exists, but the introduction of 99 cent games in the App Store – as well as the growing success of free-to-play models – has forced Nintendo and Sony to rethink their digital strategy. The new report from App Annie and IDC estimates that 44 percent of software sales will still come from prepaid game purchases this year. 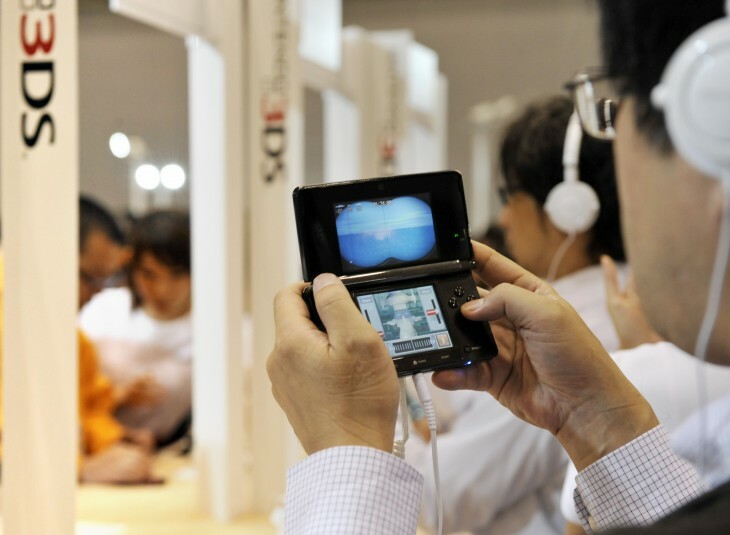 That figure includes physical cartridges and discs sold in-store, as well as the initial price set in the App Store, Google Play store or Nintendo eShop. Microtransactions, the money-maker for nearly all free-to-play titles, will rise to 51 percent of total revenue in 2013. The strategy of pulling people in with a non-existent entry fee – take Real Racing 3, published by EA – and then offering them additional content or fast-track power-ups has proven incredibly popular. The most poignant example is the recently unveiled Plants vs. Zombies 2: It’s About Time, which is abandoning the original’s prepaid model for a more lucrative free-to-play setup. 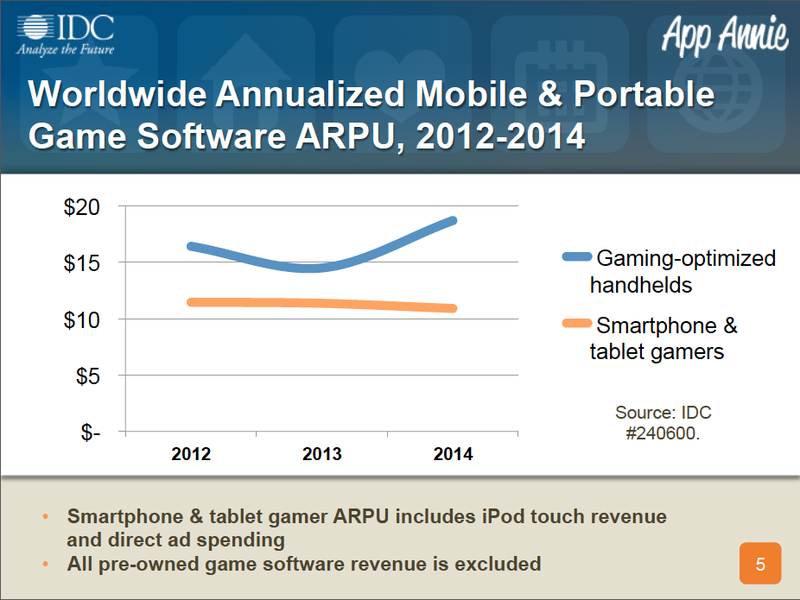 The up-tick in average revenue per user (ARPU) for software available on handheld gaming consoles suggests that full price releases will continue to be successful moving forward. As Nintendo and Sony continue to experiment with their own digital offerings – Mario and Donkey Kong: Minis on the Move is a suitable example – perhaps both companies will adopt the free-to-play model too. The rest of report covers the top five grossing genres for smartphones, tablets and handheld consoles, as well as the split in revenue between the App Store and Google Play marketplace in fourth quarter of 2013 and first quarter of 2013. An analysis of the latter can be found in our previous coverage, but it highlights that although dedicated consoles still have a role in the market, the smartphone and tablet userbase is continuing to grow much faster.